NASA mission to monitor changes in polar ice began in the name of "Operation IceBridge" and its scheduled period is 2009-2018. ICESat (Ice Cloud and Land Elevation Satellite) was the satellite used for observing polar ice from 2003 due to its malfunction, it was relieved from its service in 2009. For the mission, the satellite was not used, instead an aircraft was utilized under IceBridge program that lasts till 2020. ICESat-2 is expected to be launched in September 2018. There are huge differences between satellites and aircraft. Satellites can take measurements full-time and cover wider area but aircraft cannot. A big advantage for aircraft is that it can focus closely in lower altitude using high-tech instruments such as radars that can penetrate the ice. But, the survey can be done only by conducting a few campaigns every year. This year, flights started on March 22 for covering the western basin of Arctic Ocean and glaciers of Eastern Greenland. The campaign, in total, consisted of 20 eight-hour flights, of which, 8 flights surveyed on sea ice while the remaining 12 flights on land ice. A recent photo taken along the east coast of Greenland shows a broken iceberg over the sea, snow on sea top, water beginning to freeze again. 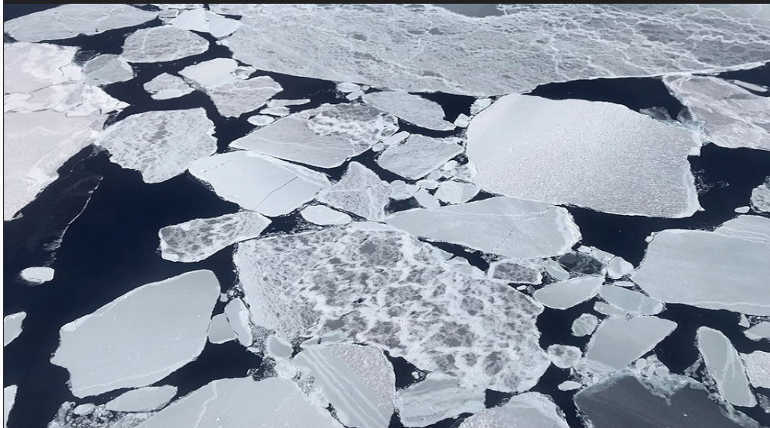 "Rapid change in glaciers and sea ice was observed in the past 10 years of IceBridge Program", said Joe Macgregor, the acting project scientist. He also added that the most of the objectives of the program have been fulfilled through this campaign.